The orientation or tilt angle zero with respect to the wind direction results almost similar and sawtooth shape oscillations formations after edge-hillocks convert themselves into the kink-shapes. This evolution kinetics is very speedy at very high electron winds χ≥50 such as that immediately formation of the daughter kink shape perturbation takes place on the windward side of the hillock while it was converted in form. The latter stage, the lee side of the converted hillock protrudes and finally hangs over itself creating a bottle neck. The large peace of material ruptures from this bottle neck, leaves the interconnect line, and drifts towards the anode end. 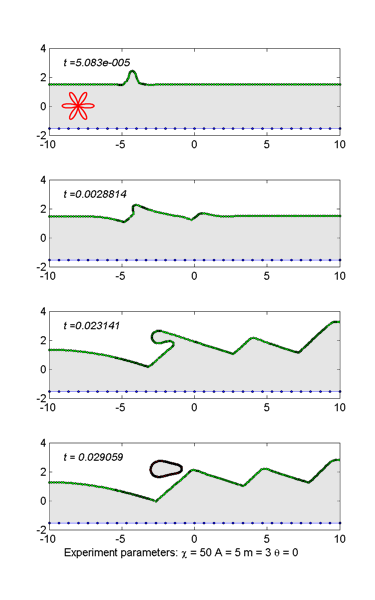 In order to simulate this event, which is illustrated in Figure, the underlayer is assumed to be acting as a shunt for the applied electrostatic field. Therefore, the broken away peace is still subjected to the applied electron wind. After this rupture, the remaining part of the hillock becomes sawtooth in shape and continuous to drift to the cathode end. Meanwhile more and more subsidiary waves are generated on the windward side. The complete package, made up by sawtooth waves, drags towards the cathode end by constantly increasing the number of their members at the front (multiplication). However, this process breaks down when the lower edge of the preceding wave, which is nothing but the original hillock with different face, touches the opposite edge of the interconnect line. At low electron wind, the hillock transform into step like wave front, and proceeds drifting towards the cathode.